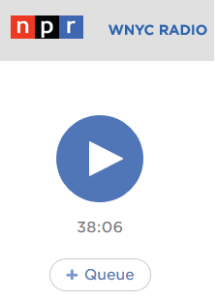 For an in-depth look at the progress being made and the potential of CRISPR, the gene editing tool, listen to this radio interview on National Public Radio. Cystic fibrosis genetics is mentioned around minute thirty-one. See excerpts below from the entire interview, with time stamps. CRISPR is an ancient bacterial defense system….a group of nucleotides….a molecular programmable GPS system. CAS9 is an enzyme. Enzymes are basically things that cut, and it’s a scalpel, a molecular scissor. 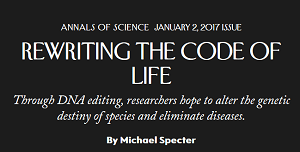 You put those two things together: You program CRISPR to go where you want and when it gets there, [CAS9] cuts the very pieces of DNA you want cut. [….] you talk to people who are dying of AIDs, dying of malaria, who’ve faced these things their entire lives and in the history of their people, and you say to them, “Would you like to roll the dice and try this?” Not uniformly, but almost always, they say, “Yeah, we want to try it, because the alternative is so horrible.” They just have a higher threshold for trying something risky because the benefit could be so remarkable. One of the concerns is – suppose we modify some organism and it has an unintended effect out in the ecosystem? Is there any way to reverse a bad decision? Can we correct a gene edit? One of the things we’ve always loved to do is use pig organs for transplants. There are constant shortages of transplant organs [….] But we’ve never been able to do it because we reject them. We reject them for immune reasons and also because the pig organs have viruses, retroviruses, and they would make us sick and we would die. [George Church at Harvard Medical School] used CRISPR to edit all of the viruses out of pig organs, every one, and he used it to change the immune profile, so that it looks like we will be able to grow pig hearts and pig livers and use them as transplant donor possibilities, and that is an astonishing advance. So is CRISPR actually in use in altering human or other organisms’ DNA? 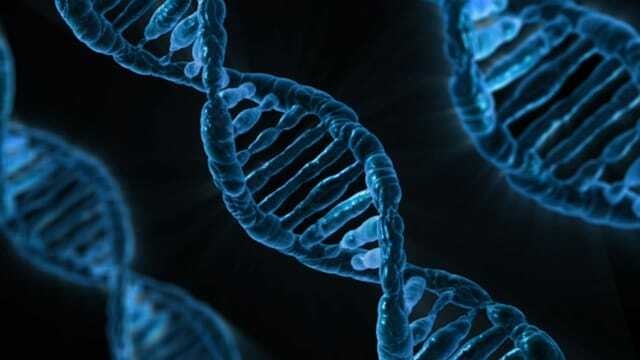 So we have this amazing potential to alter life forms through genetic editing, and many people object. They’re troubled by it. Who sorts this out? Who decides whether we go forward and in what ways? Well, you can go into an embryo, you can go into a sperm cell or egg and you can isolate the DNA [….] You can look at it in a dish and you can see the string of nucleotides, and you can see where there are problems or where there might be problems, and you can decide, “Gee, if we get rid of this, we’ll get rid of cystic fibrosis. Let’s do that.” [….] And those things are not unimaginable and not even that difficult technically to do. You can also read the article, written by Michael Specter for The New Yorker magazine, that inspired this interview. Written by: Melissa75 on January 21, 2017. I suffer from a mongentic disease alpha one antitrypsin deficiency we are severely ill through this genetic disease and I have battled to live for a decade we live in England and are denied the only existing therapy augmentation, that is appalling, I was diagnosed aged 46, ill from 45, out the blue super fit and healthy until this hit me. I was given 2 yrs to live aged 47, I managed just to survive that prognosis mostly through ignornace from the medical franterity here because nobody to date can even spell AATD let alone come across it! You might understand the frustrations here, nobody deserves this, and all we hear is this will be cured, we are easy to cure one gene and its done! …I struggle to breathe I have struggled 10 whole long years of my young life through being born with a genetic disease ticking away in me , never knowing I had this. Is that fair? Is that just? We are a sister disease of Cystic Fybrosis and yet we remain closed in the shadows forever never to be treated .. nobody should be suffering this level of ignorance and battling to live at the same darn time, we do all of us. How and when will this become a reality for people like us desperate to live, breathe again, and live again ..? It surely has to happen my hope has always remained that just something will come .. I hold onto that with my finger nails and fight for my life daily..that is a level of suffering nobody can imagine, but I have learned to cope and accept what has happend , what I lost and what ultimately I lost in my life and myself when I was diagnosed, I came back 7 and half years ago to fit and battle to continue to live prove a few scientists wrong with a 22% fev lung function in my body at that point which they also informed me was low enough to list for double lung transplant I have no lungs to speak of I have a limited life and not much quality of life but I keep going in the hope I will be lucky and get ‘fixed’…can anyone answer this beleaguered , bewildered woman with a little bag of hope on cure…? I suffer from a mongentic disease alpha one antitrypsin deficiency will this ever be cured? We have no cure, just fight and many are fighting years , its a cruel disease and a killer , it kills us very young . I was 45 when I got sick and diagnosed at 46, super fit until that point, so no signs, warnings ..a ticking time bomb, we are mostly lung affected and I have struggled a decade to breathe. I have forgotten how it feels to breathe normally . I nearly died aged 47 I had 22% fev and was given 2 yrs to live, I decided to cling on by my finger nails and fought back, I was lucky ..this has to be cured like the many cruel genetically inherited diseases that grab a person out the blue and rob them of everything ..here is to hope that someone will be brave enough to reply! Thank you for sharing your story. It would be wonderful if CRISPR could help you. I’m so sorry for all you’re going through, and I hope you continue to come to this site for information and companionship. 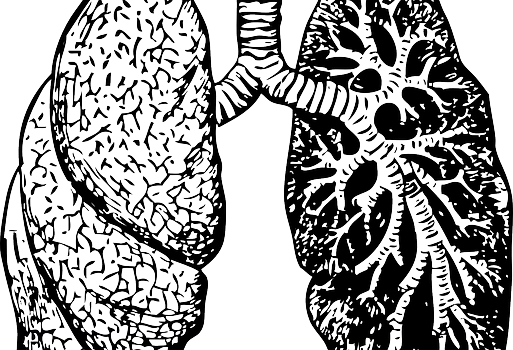 There are people on these message boards with non-CF bronchiectasis, primary cilliary dyskinesia, immune deficiencies and more. I’ve been a member here for ten years and I don’t have CF either–I have bronchiectasis.